Aside from the Uni-Ball Kuru Toga, there haven’t been any great strides made in pencil technology over the past several years. That is not a bad thing. Pencils - mechanical included - are some of the most traditional writing instruments around, and it is difficult to change an almost perfect tool. The Platinum OLEeNu attempts to bring something new to the table with its lead breakage prevention mechanism. This is not a world changing advancement in technology, but I will say it works as intended and is a nice feature. When I started the written review, I was writing with standard pressure and at a standard pace. If you look closely at the page, you can see the gradient variation when I started pressing down really hard to see if I could get the lead to break, and I couldn’t. Now, I didn’t get violent with it, but you can see how hard I was pressing by how dark the lead is. That is the major feature of the Platinum OLEeNu, and it works well. What I don’t like about this pencil is the barrel design, specifically the clip. 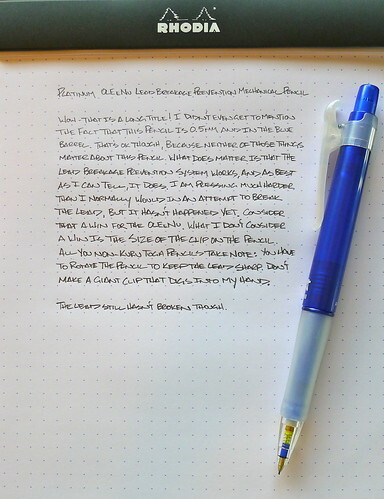 Like most of you, I rotate all non-Kuru Toga pencils in my hand as I write to keep a sharp point on the lead, and the extra large clip gets in the way of my rotation. Not a deal breaker - more of an annoyance. The grip area wasn’t my favorite either - it is best described as funky. I can’t really put my finger on it, but I don’t love it. In lieu of posting all of the technical details here, check out the specs and photos on the JetPens product page. There are some great photos and descriptions of how this pencil works. Posted on August 12, 2011 by Brad Dowdy and filed under OLEeNu, Pencil Reviews, Platinum, Mechanical Pencil.